America&apos;s Best Racing (ABR), a multimedia fan-development and awareness-building platform of The Jockey Club, today released a new and original ABR Films four-episode video series, "America&apos;s Native Spirit." The lifestyle series, presented and sponsored by VisitLex, chronicles Kentucky&apos;s rich heritage and tradition of crafting award-winning bourbon, in addition to producing champion Thoroughbreds. The series was directed, produced and filmed by ABR Films and shot on location in Lexington and Frankfort, Ky., at the family-owned, award-winning Buffalo Trace Distillery. 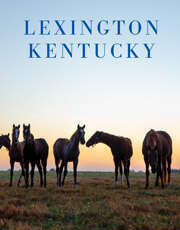 VisitLex promotes Lexington&apos;s Bluegrass region-the Horse Capital of the World-for the purpose of attracting visitors and growing the economy. "VisitLex is excited to be the presenting sponsor of this series profiling America&apos;s Native Spirit, the Buffalo Trace Distillery and Kentucky&apos;s vital role as the producer of 95 percent of the world&apos;s bourbon," said VisitLex President Mary Quinn Ramer. "Additionally, as the tourism office promoting travel to Lexington&apos;s Bluegrass region and the Horse and Bourbon Capital of the World, it is a fitting sponsorship for us. America&apos;s Best Racing does a fantastic job of promoting the inextricable bond between Thoroughbred racing and bourbon in Kentucky, and we are pleased to be supportive of it." The four-episode original series takes the viewer on a journey deep into Bluegrass country and inside the award-winning Buffalo Trace Distillery. No Kentucky distillery has earned more domestic and international accolades than Buffalo Trace. The multi-billion dollar economic impact of Thoroughbreds and bourbon in the Commonwealth of Kentucky, as well as their global reputation, is significant and unparalleled. Today, a rekindled obsession among millennials has made bourbon a $3 billion signature industry in Kentucky. Along the way, viewers are introduced to Harlen Wheatley, the master distiller at Buffalo Trace, and Freddie Johnson, a third-generation employee at Buffalo Trace. Crafting bourbon, much like developing champion Thoroughbreds, has always been about storytelling. In the end, it&apos;s all about enjoying "America&apos;s Native Spirit" and America&apos;s original sport. America&apos;s Best Racing is a multi-media new fan development and awareness-building platform, initiated by The Jockey Club, designed to increase the profile and visibility of North America&apos;s best Thoroughbred racing events, with a primary focus on the sport&apos;s lifestyle and competition. You can follow America&apos;s Best Racing at americasbestracing.net as well as on social media platforms Facebook, Twitter, Pinterest, YouTube, Google+, Instagram, and Snapchat. VisitLEX is a destination sales, marketing, and service organization charged with promoting Lexington&apos;s Bluegrass Region for the purpose of attracting visitors and growing the economy. For more information: www.visitlex.com.